Spacious and Comfortable, 1,800 Sq Ft... Our spotless and cozy townhome is only 7 years young and offers 3 bedrooms and 3 full baths. The unit was recently upgraded with new bedding, fresh colors, new furniture and High Speed Internet making it a wonderful retreat to return to after an activities filled day in Big Sky. Our home is professionally decorated in mountain decor and features hardwood and slate floors, and vaulted wood ceilings. The kitchen is open to the dining area and is fully equipped for all culinary needs. In addition, there is a separate large laundry room The master bedroom has a new king size bed, full bath, walk-in closet and TV. The second bedroom upstairs has a rustic log queen bed and a twin bed with a private full bath and TV. The "Bunk Room" (sleeps 3) is on the ground level with handmade log bunk beds and another twin log bed, TV and adjoining full size bath. 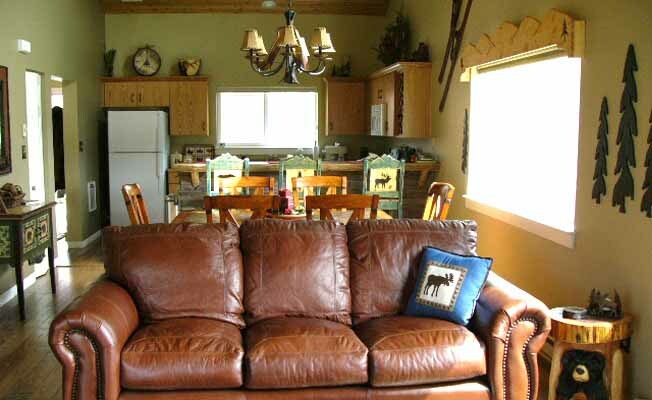 You will also enjoy the comfy and cozy leather sofa, love seat, and chair in the living room. with full size washer and dryer. A private 6 person hot tub with mountain views for relaxing after a long day of hiking or skiing. Light a fire in the floor to ceiling rock wood burning fireplace. We are always making upgrades to our condo because we like to use it too!!!! Located in the Meadow Village near the new Big Sky Town Center. Shopping and dining are just a moment away. Free mountain shuttle stop is steps out the door. Yellowstone National Park entrance is approx. 20 miles away. Big Sky is an all season destination. World class fly fishing, horseback riding, hiking, white water rafting, mountain biking and golf in the summer. In the winter...Big Sky offers 3,600 acres and 150 named ski runs with no lift lines, snowmobiling, sleigh ride dinners, cross country skiing...the opportunities are endless and the snow plentiful. Over 400+" a year adds up to a lot of powder days!!! Big Sky is a very unique destination and we love to spend our vacations there. If you wish, we will gladly assist you by recommend places to explore, the best places to eat, the best horseback riding outfitters, the best hiking trails or the best ski runs...We are happy to help provide you with the best vacation experience possible. We offer discounts to repeat guest or stays over 7 nights!!!! Inquire about on mountain ski locker and spa privileges at Moonlight Basin.